One day, while browsing the many hashtags of Instagram and I caught myself drooling over a glistening mountain of finely shaved ice decorated with azuki beans and cubes of banana, strawberry and grapes. 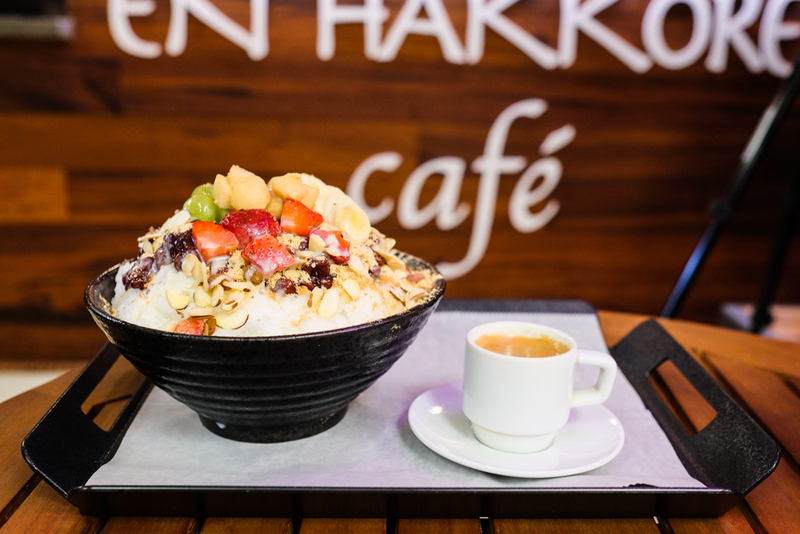 Patbingsu, Korean-style shave ice, is finished with chewy lobes of mochi, toasty almond slivers, sweet condensed milk and nutty roasted soybean powder (bokkeun konggaru in Korean) for a flavorful and wildly textural experience. It’s undeniable that the weather is heating up and we Fat Kids feel the best way to cool off is to dive spoon first into this jumbo-sized ramen bowl of patbingsu amongst produce and ajumma aprons at the back of a Korean supermarket. At $10.49, the larger of two sizes is best shared amongst two or three. Beware, the shot of espresso you add in is a jolt of energy you may or may not have expected. If it’s not the fluffy shaved ice or the tart bits of fruit that keep you digging for more, the mochi and roasted kinako powder are sure to keep you searching for respite.